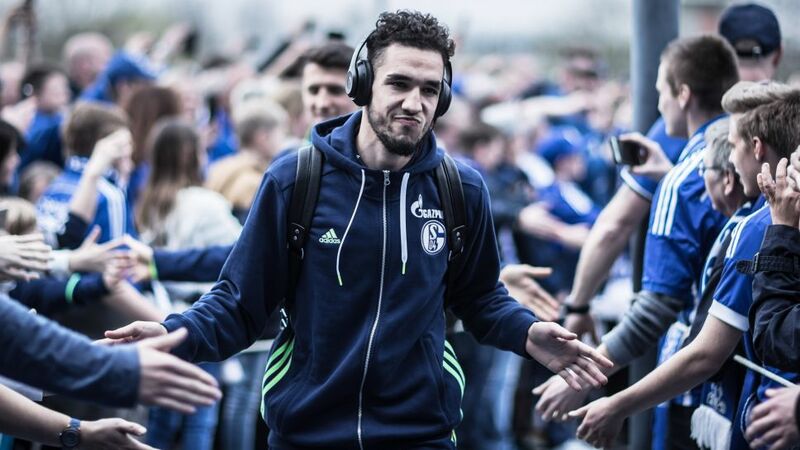 Nabil Bentaleb has taken to Schalke just as the Royal Blues' fans have happily welcomed him into their hearts, and the 2017/18 season promises to see the love affair between the the über-talented midfielder and his club's passionate fans deepened. For a man who was born in France, played as a youngster in Belgium and England, and represents Algeria at international level, it is perhaps not surprising the artful midfielder possesses the chameleon-like adaptability to quickly blend into his surroundings. Like the football-mad populations of its sister regions of north-east England and northern France, the coal mining area around the Veltins Arena yearns for moments of brilliance on the pitch. Bentaleb, who hails from Lille, close to France's northern frontier, understands and provides that, which explains why the Algeria international was adopted so quickly. As good a strike as it was, it was only worth a point to Markus Weinzierl's men, and was symptomatic of the inconsistency his side showed throughout the campaign. Bentaleb was not immune to football's most common plague either. Four goals and one assist came in the first half of the season, earning him the bundesliga.com Rookie of the Hinrunde award; just one league goal and three assists arrived after it. But by then, Bentaleb had already been convinced he had found a new home, just as the club were happy to have unearthed a rare gem, transforming his season-long loan deal into a four-and-a-half-year contract after just six months. "Even when Tottenham were top of the [English Premier League] table, I didn't want to stop my transfer," Bentaleb had explained last season. "At Schalke, they believe in me. I had decided on that, and it wasn't going to change just because we lost a few games." What did change was his boss, with Weinzierl replaced by Domenico Tedesco over the summer. The impulse to make forward progress provided by the new coach was matched by Bentaleb himself, who had stated that he hoped the team would qualify for European football and "what I expect from myself is to improve my game still further." He could barely have asked for a better start, netting a penalty — and then running the length of the pitch to celebrate with his training ground spot-kick sparring partner Ralf Fährmann — in the Matchday 1 win against RB Leipzig, which must have had Schalke's long-suffering supporters licking their lips at the prospect of the season ahead. That optimism took a blow when Hannovertriumphed 1-0 over their heroes on Matchday 2, a performance that shows Tedesco and his team have more work to do to fulfill Bentaleb's ambition of bringing "more consistency to our play". The former Tottenham Hotspur man also has to find his feet after reverting to the deeper midfield role he played earlier in his career after featuring further up the pitch under Weinzierl. His ability to adapt will again serve him well in that, but Schalke fans can rest assured his trademark derring-do will remain a leitmotif of his game … unless his boss asks him to change. "When I take risks and score a goal or set one up, everyone is happy. But sometimes it doesn't work — I'm no Messi or Ronaldo," the 22-year-old admitted. "Not everything comes off, but I'm not afraid to try it again. Of course, if the coach wants me to keep it simple, then I'll do that too — it's even easier for me."